It is with a very heavy heart and much sadness that we have to report the passing of our young tiercel, Genesee. 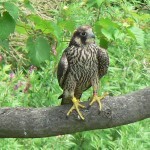 The Rochester Falcon Watchers have been watching him since his return to the Rochester area last year. He was mostly seen in the Charlotte/Summerville area, but there were reports from birders seeing him along the lake shore hunting as far east as Sodus. We were all very happy to recently learn that Genesee had found a mate. Yesterday, 1/7/17, Rochester Falcon Watchers Dana Mulhern and Carol Phillips were out checking the lakeshore, hoping to find Genesee and his mate. 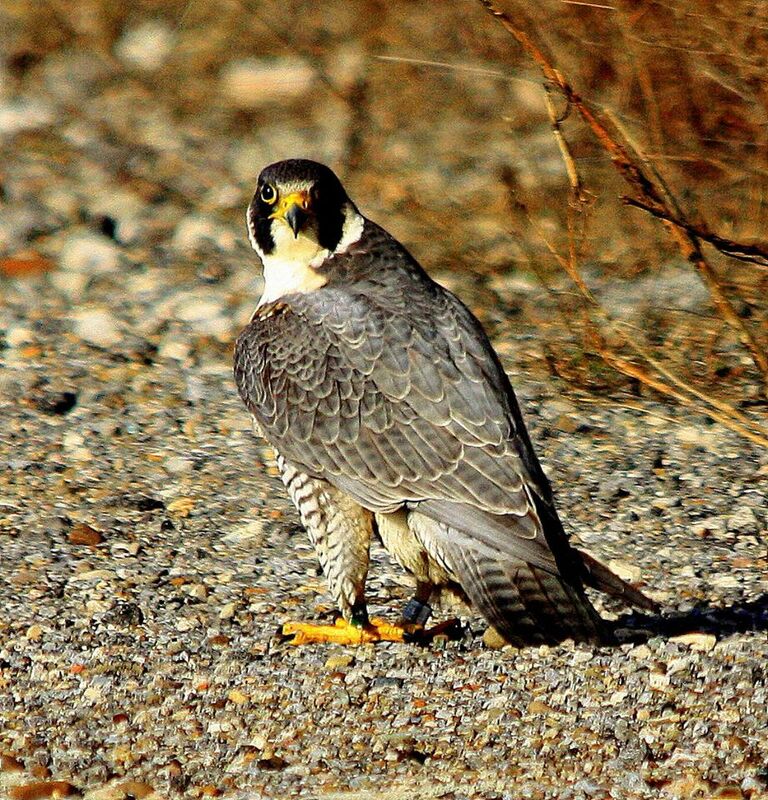 When driving over the Irondequoit Bay Bridge they spotted a falcon down on the road. They contacted the DEC and Officer Snowden retrieved the falcon. He kindly let us know that it was in fact Genesee and it looked like he had been hit by a car. There was a dead Merganser nearby and he thought that may have been what caused Genesee to come down to the roadway. 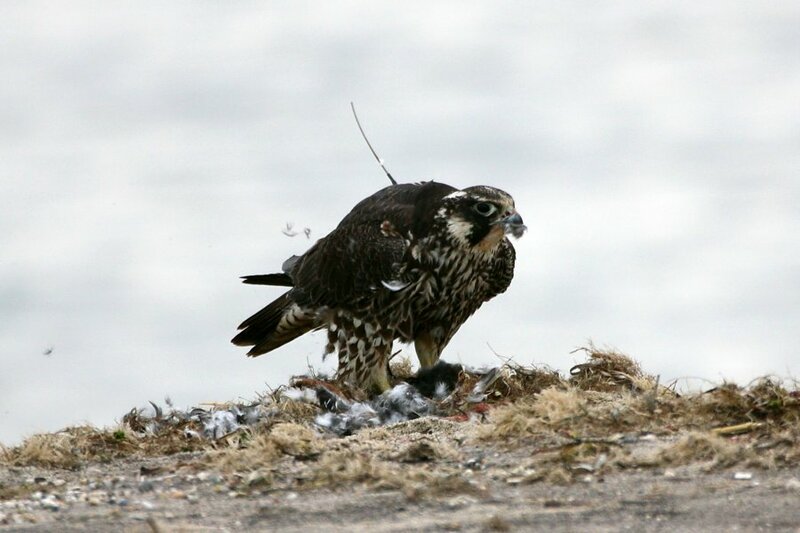 Genesee made it thorough that very hard first year which a large majority of young falcons do not survive. He found a mate and we had high hopes that, with her, he would raise young of his own. 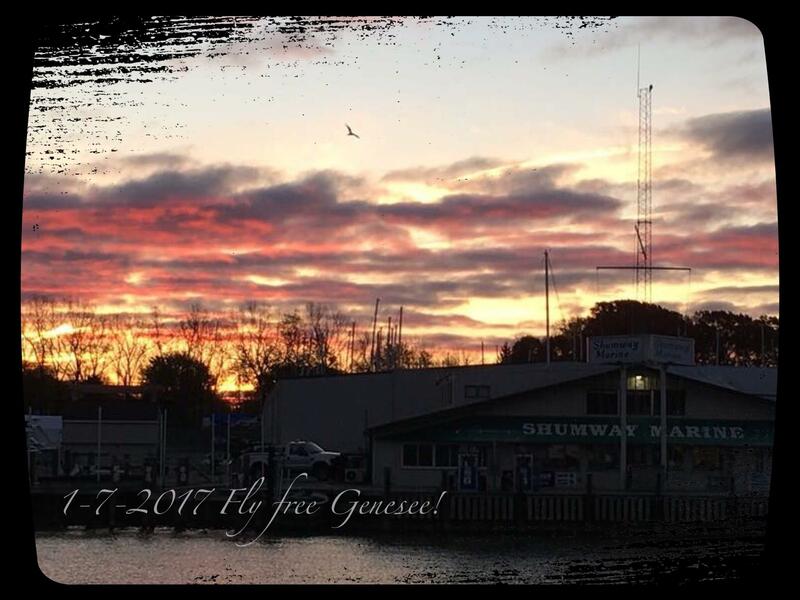 Fly Free Genesee. We will miss you. Well, you know we love to hear news about our Rochester falcons, especially when awesome pictures are available! Gallagher Beach is not that far from Central Terminal, where Diamante and Gleig nest. It would be interesting to know if Gleig is the 2nd falcon that Jerry has been seeing. Jerry kindly gave us permission to post his pictures of Diamante. We knew you would all love to see him! Quest is Transmitter Free! and She Has a New Suitor! 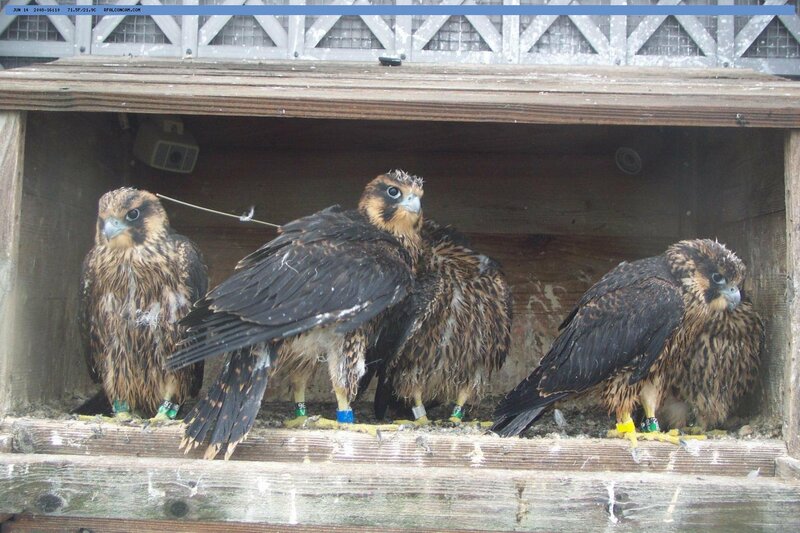 We have received some very good news from our friends at the Canadian Peregrine Foundation. Quest no longer has her transmitter. 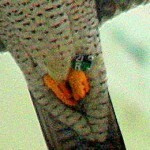 Rfalconcam Forum member Donna Cook was able to capture some pictures of Quest taken by the Harlequin falcon cameras. She immediately noticed that something was missing. The transmitter antenna we were so used to seeing on her back was gone. 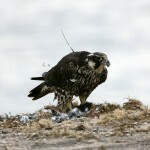 She shared the pictures with other members of the forum and members of the Canadian Peregrine Foundation (CPF). Many thanks to Donna and CPF Member, Bruce Massey, who positively identified that it was Quest at the Don Mills nest site and that she no longer had her transmitter! Here is Bruce’s report. With the nest camera back online and showing us views of the adult peregrines active around the site, I decided to venture out to do a quick check in. One of the most conspicuous things about Quest these days is that in the camera shots taken of her at the box, the antenna of her transmitter could not be seen at all. I set out to try and confirm whether the female was Quest and if she was now backpack free. I found her in and around the nest box soaking up the sun and with my scope was able to get excellent looks at her back. I can say without doubt that the backpack harness and transmitter she has been wearing for the past several years is no longer there. Quest was looking quite fabulous, all her feathers sitting neatly preened across her back and chest. I was also able to confirm her recovery band number as Black 96 over Green V as she sat sunbathing. The male was also quite active in the area and the two met at the box a number of times bowing and vocalizing together. I set the scope on the male and turned my attention to the task of confirming his identity. He spent a great deal of time up on the Harlequin building sitting in the sun and I waited for him to do some stretching and reveal the look I was seeking. At first glance I was able to only see the USFW band and it was covered in blue tape. This was not consistent with Skye, the male that was with Quest this past nest season. I continued to watch and finally got the look that I was waiting for. The band number that I could clearly see was a solid Black Y over 72 with blue tape which turns out to be a bird hatched in 2013 at the Amexon nest site named Lucky. We are unsure when this change took place and where Skye is currently. We will have to wait until spring to clearly understand whether Lucky or Skye will be Quest’s mate for the 2015 nesting season. 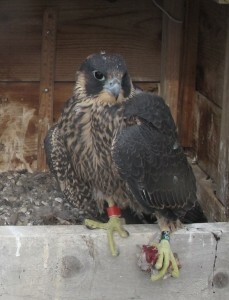 Here are some images of a young Quest with her transmitter in 2008. She did a lot of wandering her first year and made lots of friends, especially in Nantucket and Cape Cod. Offspring Update: Ihteram Found Again! Good News! Ihteram, daughter of Mariah and Kaver from 2005, has been found again after an absence of five years. Here is a link to the April 14, 2008 Imprints posted when Ihteram was found nesting at historic St. Joseph Catholic Church in Detroit, Michigan with her mate, an unbanded tiercel (male). There was very little news posted about Ihteram and her mate, so we lost track of them. Now, we are very happy to report that five years later, Ihteram has again been positively identified. 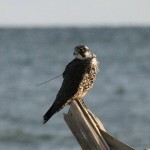 Rochester Falcon Watcher Joyce Miller had been corresponding with Barb Baldinger of the Macomb Audubon in Michigan. 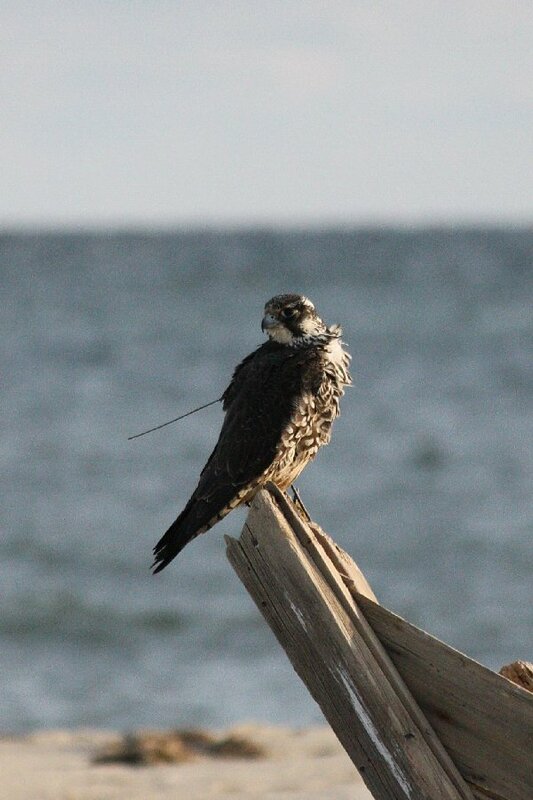 She is a volunteer who helps monitor the Peregrine Falcon nest sites in Michigan. Barb told Joyce that there was a new nest site in Detroit and the female was banded, *2/R (black/red). Joyce immediately recognized the band numbers as one of our own, Ihteram. She notified Barb with the good news. 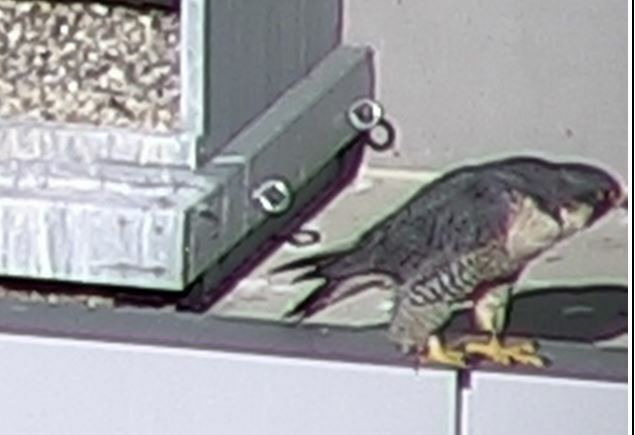 Ihteram and her mate have established a new nest site in downtown Detroit (MI) on the roof of a skyscraper. The nest has 4 eggs in a partially protected corner. If all goes well, there will be some new additions to the Rochester falcon family. 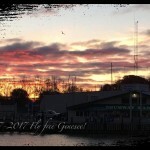 Many thanks to Joyce and Barb for sharing this wonderful news! Stay tuned. Hopefully there will be more news to share soon. Here is a picture of Ihteram that Barb took yesterday (May 20, 2013). She attempted to get a picture of the tiercel, but he took off before she could take it. Also, a couple pictures taken, one by Marcia Lyman and one by Louis Capuano of Ihteram after she fledged. A Tiercel Named Sabrina. Fly Free Valiant! Sadly, we have to report the loss of another Rochester Falcon. On Monday, January 23, 2012, a falcon was found dead on top of a school in East Aurora, close to Buffalo, NY. 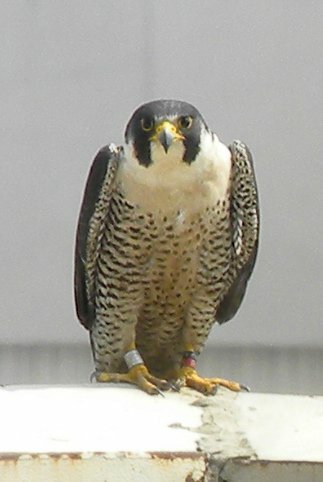 The DEC was notified and they confirmed that it was Valiant, a Rochester Falcon hatched on top of the Kodak Tower in 2006. It is assumed that he hit the building. 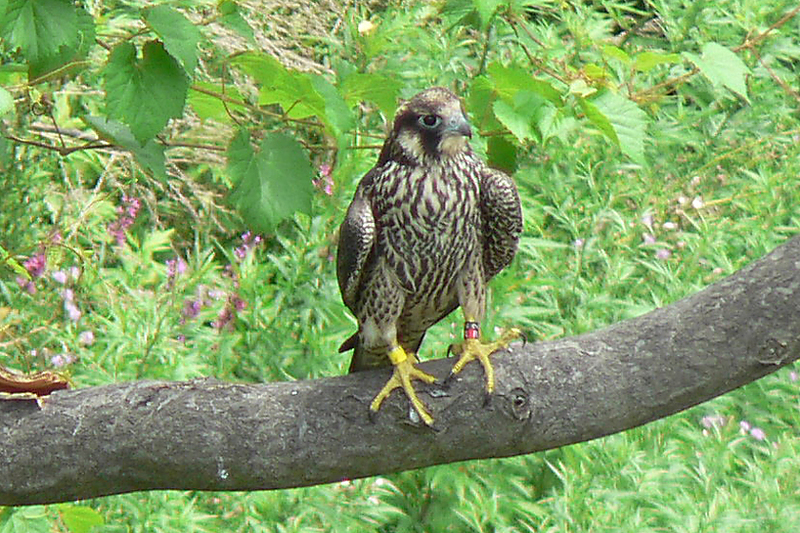 Valiant aka Sabrina was one of three falcons that hatched in 2006. As many of you know, that was the year that Mariah badly injured her leg and Kaver became a super dad. 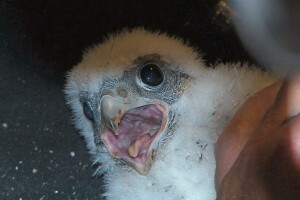 Rochester Falconcam Watchers, anxiously watched Mariah’s struggle to brood, feed and raise three young eyases. We were in awe when we saw Kaver bring food to Mariah at the nestbox to feed her and the eyases. 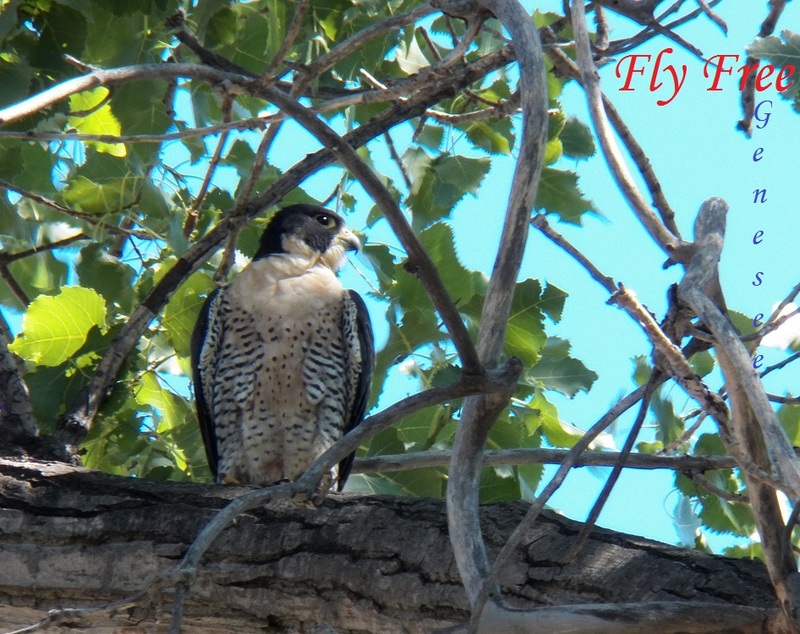 Out of what could have been a tragic year for the Rochester Falcons, three young falcons grew and flourished on top of the Kodak Tower in Rochester, NY. Rhea Mae, Aura and a tiercel named Sabrina. On banding day, the DEC collected the three eyases. Second to be banded was the smallest eyas. After careful measuring of the leg and further examination, it was determined that this was a small female. 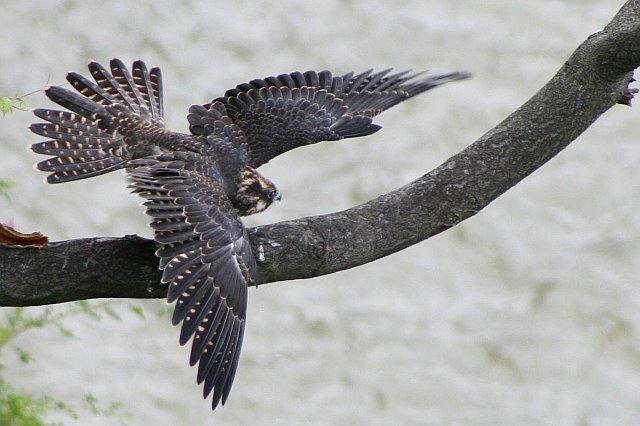 Long time Rochester Falcon Watcher Dan Stiehler had been given the honor of naming this eyas. He had submitted two names, Sabrina for a female and Valiant for a male. That day the name Sabrina was given to this small eyas. This was the name submission from Dan. Sabrina – Latin: Vibrant, Full of Life. These are just two characteristics so highly evident in matriarch Mariah. As time went on, it was more and more obvious that our Sabrina was actually a male. He was much smaller than his two sisters. But, until it could be proven that she was a he, the name Sabrina would remain for this handsome tiercel. Sabrina, Rhea Mae and Aura thrived under the care of their doting parents and fledging was near. Mariah healed and Kaver continued to hunt and care for his family. Falcon fans around the world nervously watched the camera at the nest box on top of the Kodak Tower. Three young eyases flapped their wings furiously, strengthening them for that first flight. Sabrina was more advanced than his bigger sisters. Smaller, he was after all a tiercel and would take flight first. He did! The Rochester Falcon Fledge Watchers were down below, waiting. Flap, flap, flap, flap! Flap, flap, flap, flap! He’s off!!!!! Sabrina was first to fledge that year and he flew strong and sure. That Spring/Summer of 2006 was a very special year for all of us. Six eggs were laid, three survived to fledge. Two of these three went on to nest in areas where they were seen and reported. We have had no word of Aura, but Rhea Mae is currently nesting on the 43rd floor of the Sheraton in downtown Toronto with her mate Tiago and Sabrina was nesting at the Ogdensburg-Prescott International Bridge over the St. Lawrence River. But wait! Sabrina was observed that first year and guess what? We had our first “official” proof that Sabrina was in fact Valiant!!! Yes, Valiant was definitely a tiercel. 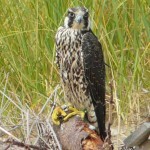 During the years that he and his mate Zanar from Ottawa, Ontario, Canada nested there, it has been reported that they laid 7 eggs and 2 young falcons fledged. This is not a very safe nesting area since it is under a bridge over water. Rochester Falcon Watchers Dan Stiehler and Lisa McKeown had actually visited this nest site but were unable to see Valiant or Zanar. RFalconcam Forum member Janet, a first time Rochester Falconcam watcher in 2006, told me that had been the first time she watched. 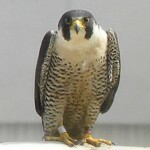 She only viewed the cameras, never visited the discussion board, so she had no idea what this small falcon’s name was. She called him “Red”, because the DEC had wrapped Sabrina’s USFW silver band in red tape, to make it easier for the watchers to ID them. 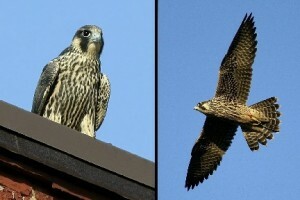 2012 has started with the loss of two of our Rochester Falcons, Callidora and Valiant. 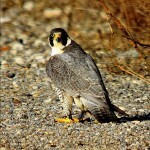 With the celebration of sending new Peregrine Falcons out into the world, we must also deal with their loss. Fly Free Valiant and Callidora. It is with sadness and fond memories that we say goodbye. 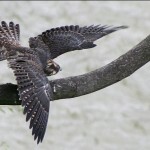 We here at the Rochester Falconcam, hope that 2012 will be successful and that Beauty, Archer and Unity will raise young that will continue the legacy of the Rochester Falcons and help to raise awareness of an endangered species. We learn something new every day about these beautiful birds. Thanks everyone for continuing to watch and support the Rochester Falcons. Rochester Falconcam team members have spoken to Beth Shoaf & Lisa Vezzani, volunteers at Wildlife Works in Youngwood, PA. With their help, we were able to find out more about what happened to Callidora on Friday, January 20, 2012. According to Beth & Lisa, Callidora was found inside the ArcelorMittal Steel Mill in Monessen, PA on January 20, 2012. She was spotted by workers inside the mill on the ground with her injured right wing hanging low, unable to fly. They were able to catch her and contact Wildlife Conservation Officer Beth Fife, who took Callidora to Wildlife Works, located about 40 miles from Pittsburgh, PA.
Callidora’s wing was badly damaged. Both the radius and ulna were shattered in three places. The breaks were severe. The Antebrachium is the middle portion of the wing, consisting of the radius and ulna. The secondary feathers attach to the ulna. Later that day, after further inspection of the wing by the rehabber consulting with an orthopedic surgeon, they found it to be totally shattered and non-repairable. They decided the kindest thing to do was to euthanize her. They are saddened by this as we all are. There is no way to know what happened to Callidora to cause the injury to her wing since there were no witnesses as far as we know. The one thing the rehabber was able to say is that she was not emaciated and that she had a full crop. She also had her adult plumage. Callidora was found in Monessen, PA. Click on this link to see a picture of the area. We here at Rochester Falconcam and all the folks that watched Callidora and her brother Jemison grow to fledge from the Times Square building in downtown Rochester, NY, want to thank Beth, Lisa and all the good folks at Wildlife Works that helped with Callidora’s care. A big thank you to the workers at the ArcelorMittal Steel Mill in Monessen, PA, who rescued Callidora and contacted Wildlife Conservation Officer Beth Fife, who we also thank. Also, thanks to Kate St. John for contacting us to let us know what happened and Juanita Woods for helping to identify Callidora. Fly Free Callidora. You will be missed by many. we must report that Callidora has passed away. This afternoon, we received a call from Beth, the rehabber that had been caring for Callidora. She informed us that Callidora’s injuries were too severe and there was nothing that could be done for her. Because of this, last night, Callidora was euthanized. 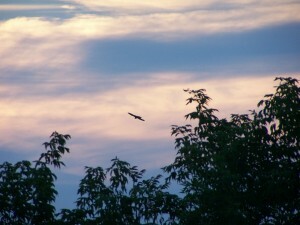 We here at Rochester Falconcam are heartbroken, but we know that everything that could be done for her was. Callidora is at peace now and no longer suffering. We are trying to find out what happened. When we do, we will share that information here on Imprints. Thanks to all that cared for our beautiful Callidora. Also, we are inquiring how we can get donations to the rehabber to help with expenses for Callidora’s care. Many of you have shown interest in doing this. As soon as we get this information, we will share it with you. It amazes us here at Rochester Falconcam how entwined the Rochester falcons have become with the Pittsburgh falcons. We have Beauty, Dorothy’s daughter and Unity, Dorothy’s granddaughter. How incredible is it that Callidora ended up so close to her Grandma Dorothy. It is definitely a small falcon world out there. We will continue to post updates as we receive them. Many thanks to all that have helped Callidora, from the person who found her and got her much needed help to the rehabbers and vets that are taking care of her. Thank you! Get well soon Callidora! Lots and lots of prayers and healing thoughts are coming your way! We received this from our friend Kate St. John in Pittsburgh, PA. This is all we know at this time. Kate has promised to share with us all updates she receives from the rehabber. Any updates on her progress will be posted here on Imprints. We here at the Rochester Falconcam wish Callidora a speedy recovery and hope that she is able to be released soon. So, What’s Been Happening This Summer? There hasn’t been much to report, but here’s a quick summary of what’s been happening this summer . Although there were no young fledglings to watch, the Rochester Falcon Watchers have been busy keeping an eye on the two nest sites here in Rochester, NY. Beauty remains in the downtown area, and is seen frequently on camera at the nest box on the Times Square building. Unity is seen almost daily at Kodak Park. Currently, Archer seems to prefer the company of Beauty and the downtown area, but is seen periodically with Unity. The Watchers will continue to report their sightings. The Rochester Falcon Legacy continues to grow. Three of Mariah & Kaver’s daughters successfully nested in Ontario, Canada. Rhea Mae (2006) & Tiago at the Sheraton, Downtown Toronto. There were four successful fledges this year. Sunshine (female) was first to fledge and she did extremely well. It wasn’t long before she was chasing Rhea Mae and Tiago around the high rise buildings that surround the Toronto Sheraton. 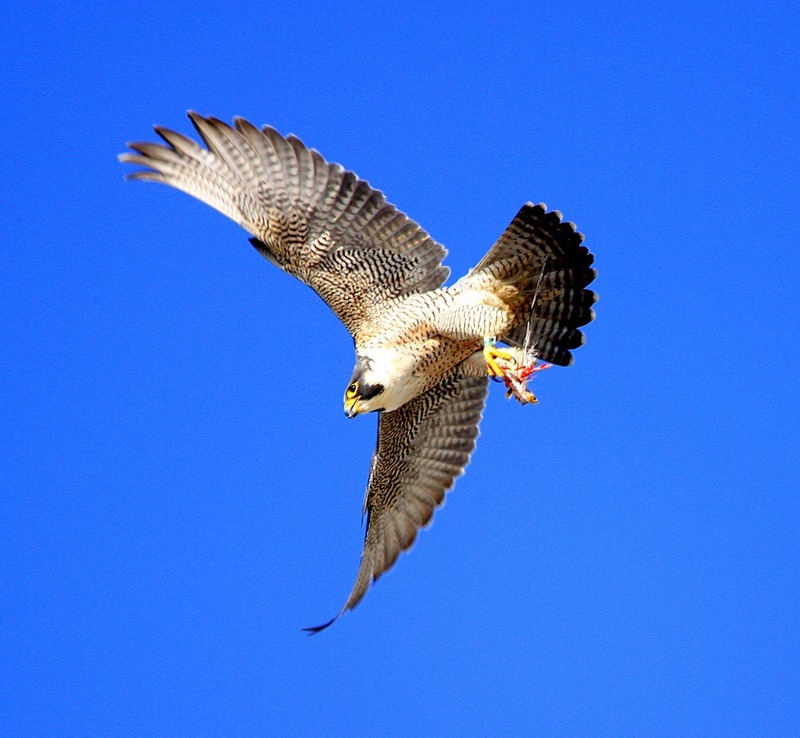 The Canadian Peregrine Foundation (CPF) volunteers were quite amazed by her flight skills. Next came William (male), Kate (female) and Cinnamon (male) . Sadly William and Kate did not make it. But, Sunshine and Cinnamon are still seen on camera now and then. Linn (2007) & Reuben at the Scarborough/Yellow Pages nest site successfully raised three eyases named Rhiannon (female), Jet (male) and Striker (male). All fledged successfully. Many reports and pictures have come in showing how well these three have been doing. Quest (2008) & Kendal at the Toronto/Don Mills nest site. Happily Quest has finally settled down from her wanderings. She and Kendal chose the building across from Harlequin Romance headquarters. 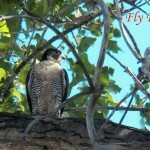 The folks at Harlequin took the young Peregrine couple into their hearts. 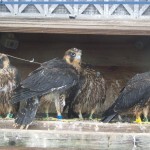 They contacted Mark Nash of the Canadian Peregrine Foundation when they first arrived. Mark and the CPF folks quickly sprang into action and a new nest tray was installed. Quest seemed quite familiar with the nest tray, and laid one egg, after losing her first egg on the ledge. Harlequin set-up a camera and pointed it at the nest tray. 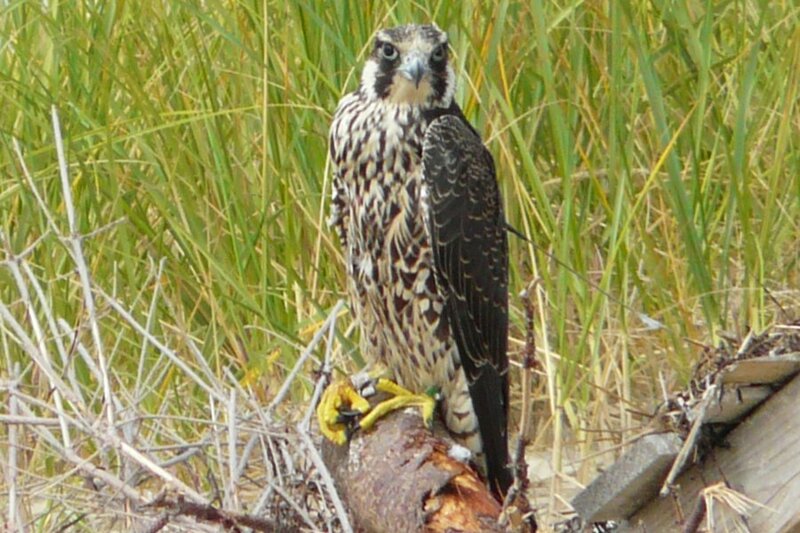 Falcon fans around the world witnessed the young eyas named Harlequin aka Harlie, break out of her shell and grow into a beautiful fledgling. Quest, Kendal and Harlequin continue to visit the nest tray. We are very thankful to Mark Nash and all the folks from CPF who take such good care of our girls. We applaud their efforts and special thanks to the volunteer Watchers who put in so many hours watching the young fledglings take their first flights. Also, thanks to the Harlequin folks who made Quest, Kendal and Harlequin a part of their family. Thank you all. One more thing. Yes, Quest still has her transmitter. We’re not quite sure how much longer it will remain on her. I do believe her transmitter readings are still being received, but of course they are currently all from the same area. You are currently browsing the archives for the Offspring Updates category.